. buna, funa 鮒 as kigo and food . kind of crucian carp. It swims upriver to spawn and makes the river muddy. This funa crucian carp lives in the lake Biwa and in autumn and winter his fins become red. 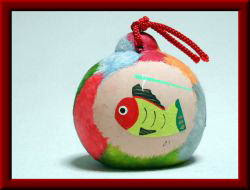 Crimson-finned.
. Kibuna, ki-buna 黄鮒 / 黄ぶな yellow crucian carp amulet . and katame no buna 片目の鮒 legends of various prefectures.
. katame no buna 片目の鮒 crucian carp with one eye .
. katame buna 片目鮒 the buna fish with one eye .
. A legend from 南丹市 Nantan . Near 武蔵国河ごえ the town of Kawagoe there is a place called たて Tate. A child once wanted to wash a horse, but the horse went wild and the child fell in the river. The villagers saw a Kappa nearby, caught it and wanted to kill the Kappa. A priest from a nearby temple felt pity for the Kappa and asked the villagers to forgive him. The Kappa promised never to attack humans or animals in the river and then went off. That night, the priest found two buna 鮒 carps at his bedside, a present from the greatfull Kappa. In front of the main hall of the temple 医王寺 Io-Ji there is a pond where fish are let free - but they soon become fish with only one eye. They are maybe buna 鮒 fish of Yakushi Nyorai.